The BreedMate family of Pedigree Software Packages covers dogs, cats, horses, goats and other animals. The package comes with 50+ forms and you can create or modify tables and forms so the possibilities are endless... BreedMate and related software are products of Wild Systems, based in Australia. The office will be closed from 22 Dec 2018 until 9th Jan 2019. Products can still be ordered and dispatched but we won't be able to answer any emails until we return. 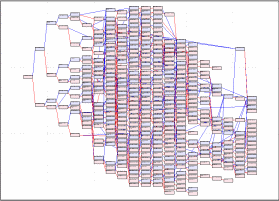 Our premium pedigree software is Pedigree Publisher or PedPub for short. In the long run it is replacing PedX and is being rapidly developed with new features being added monthly. Like PedX its easy to use and has a lot of advanced features like the Pedigree Chart and Merge Manager but also has some new features like direct PDF file generation, circular pedigrees and 8 gen Tabloid pedigrees. Unlike PedX PedPub can handle high resolution 4K monitors. To find out more and see how it compares with PedEx click here. We don't currently offer a demo of PedPub but if you would like to see how it works please check out this YouTube introductory video . Pedigree Explorer or PedX has been poplular with our users for over two decades for its ease of use and a host of features like the Pedigree Chart which in one screen can show more than 100+ generations of ancestors and the Descendants Chart (Reverse Pedigree) which can show eight generations of all offspring! PedX also has an advanced Merge Manager function that allows interactive comparison and merging of data. Recently we also added a powerful scripting language called RIO so its easy to do powerful analysis and reporting. FREE DEMO! Want to create your own online database? Then join over 45 PedPoint users who have put their databases online. We provide Pedigree Point free of charge if used for private purposes and with Breedmate you can update your on-line database with one click. We can also optionally assist with installation or repairs and updates. PedPoint is based on PHP and MySQL, supports millions of records and offers powerful search and reporting, e.g pedigrees, reverse pedigree, sibling, breeding and vertical pedigrees. Registered users can get the latest version of all our software here! Anyone who has puchased since 2002 can upgrade to the current full version for only US$20 at our on-line STORE. This is where new users and users getting upgrades will start the download process. Simply enter the registration number you were supplied with, press the Login button and the appropriate download page will be displayed. Note every upgrade is a full installation and does not require any previous version to be installed. Our software comes with 50+ forms plus the user can FULLY customise the database and the forms so the possibilities are endless. Windows 10 compatible PedPub and PedX are fully compatible with Windows 10 and Windows8/8.1/Windows7/Vista/WinXP. PedX will run on both 32 bit and 64 bit and PedPub only in 64 bit. Easy to import and export data to other applications like Excel, Word and Access. Users can actually copy and paste data from Excel or Access and paste data directly into Excel. Publish your data online With Breedmate its easy to publish your pedigrees online with our free PedigreePoint web software. Single click publishing allows you to upload updates from Breedmate to your web site so tohers can search for and view pedigrees. See the sample site at PedigreePoint. Fast PedX will handle up to 1M records. PedPub will handle 100M+. 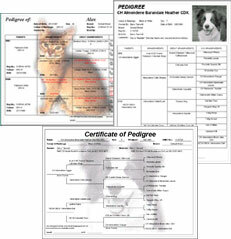 Large range of predesigned pedigrees forms plus the ability to design your own or fully customise existing forms. Free Breed databases We offer free starter databases for many breeds and our data is open so you can export and import data from many other formats. You can save the downloadable installer and burn to CD for later installs; you're licensed to install on up to three computers that you are the main user of; downloadable PDF user manual; Breedmate can be installed on a flash drive so it runs on any PC you plug it into; easy to show your pedigrees online with our free PedigreePoint web software. Julie Brown - BTW I've been using this program for probably 10 years now...originally it was purchased to save handwriting out those certificates but it has led to a real passion and interest in breed health, history, etc. Being able to run such thorough analysis, COI etc on dogs has put a whole new dimension and perspective on breeding. I cannot thank you enough for this program. It's proven to be such a valuable tool and the information I've acquired has helped a lot of people, and dogs. Helen Scott - Yorkshire TerriersI do love your program. Have tried them all including [names deleted] etc. Breedmate is fast, intuitive, stable, flexible, awesome capabilities, enables detail and a plethora of data. Merge Database is supurb. Have surprised myself in being successful in modifying forms and text reports but my ability in that area is somewhat limited. Gillian Bartlett - www.teraustralis.com Breedmate is most accurate, as the program makes it hard to misspell the a dog's name by mistyping (it asks if you want to add a new entry when it is spelt differently, thus alerting you to a variation in the name). It can be used to plan litters by checking the inbreeding co-efficients, duplicated ancestors, colours of coats in the ancestors - so much information to be seen. Here are our answers to some actual questions from users. Is the program purchased outright or is there an additional monthly fee? The program is purchased out right – it’s yours forever. There are no monthly fees. It comes with one year of free support including free upgrades. Upgrades will always be cheap - since 2002, users could upgrade for just US$20. Is all data and program stored on my computer or in the cloud? All the data and program is stored on your computer. Nothing is stored in the cloud. In fact all data for each breed is in one convenient file so you could have Boxers.db, Poodles.db, MyHorses.db so they are easy to make backups by just copying the files to a USB etc. BTW there is no limit on the number of breed databases. My horses have multiple registration numbers and other IDs can you modify the files for these added requirements? No problems adding any number of fields to any table in each database. All databases and forms are fully customisable. Can a picture(s) be added to each entry? A picture can be added to each entry. Some forms are designed to show photos usually just for the first two generations due to fitting them in but all forms can be modified to include photos. Is there a limit to the number of animals? We use a popular open source database called SQLite which has huge limits, certainly greater than 4 billion records. Is the program downloaded after purchase? If so what if you change computers? After purchase we send you an email with download instructions. Within your support period you can download the installer an unlimited number of times. You can also save each installer and use it an unlimited number of times.You can install on up to three computers at the same time that you are the main user of. You can reinstall on replacement computers an unlimited number of times. At this point on your production which program do you recommend for my use and what are the benefits of combining your programs? At this point we always recommend Pedigree Publisher rather than Pedigree Explorer. It is our newest program and is where all development will occur going forward. There is no advantage to having both programs. I will have many 100's of hours of data entry and want to make sure this will last the rest of my life! LOL All of our programs allow exporting or importing from Excel, Access, CSV and many other formats so you will never lose your data.